Is the Gadsden flag too hot to handle? The city of New Rochelle, NY has confiscated a Gadsden flag that flew outside a local armory due to “unspecified complaints” to the city manager and a request by the city council. This happened just after the city manager told a group of veterans the flag could remain in place. The situation is reminiscent of last year’s brouhaha over the Gadsden flags at Gettysburg. As many commentators have pointed out, the Confederate battle flag is a symbol with multiple meanings because of the various groups that have appropriated it over the years. Depending on the context, it can stand the Confederacy, the South in general, rebelliousness, racism, segregation, or the “redneck” stereotype. If you’re going to display the CBF, you have to keep this multiplicity of meanings in mind; the meaning you intend to convey might not be the same one understood by the people who exposed to it. In the case of the Gadsden flag, though, I think the case is a little different. The Tea Party adopted the Gadsden flag, but unlike the CBF, the Gadsden flag hasn’t been stewing in its more modern political connotations for decades. It remains primarily a symbol of the Revolution and America’s commitment to liberty and self-defense, and for that reason I don’t see anything wrong with flying it outside an armory. But that’s just my opinion. I just met Ariana Richards. Any personal milestones I reach henceforth are thus rendered insignificant by comparison, and that includes marriage and the birth of my firstborn child. They’re building some sort of retail/entertainment complex on top of it. 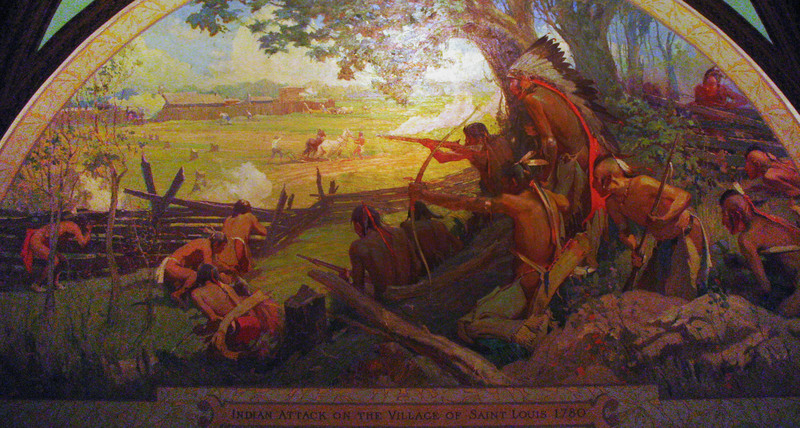 Not much to see at the actual spot, but there’s a pretty cool mural at the Missouri State Capitol. Here’s an exciting opportunity for all you loyal readers at the Federal Correctional Institution Englewood in Littleton, CO. Your fellow inmate Rod Blagojevich, former governor of Illinois, is now teaching Civil War history. If you’ve got some time on your hands—and I’d imagine you do—why not celebrate the sesquicentennial by learning a thing or two? You might recall that, during his time in office, Blagojevich slashed funding for the Illinois Historic Preservation Agency and gave the state’s historic sites the cold shoulder. I love a good redemption story. This guy’s got all his ducks in a row. Reference to the USSR? Check. Use of the felicitously vague label “progressive”? Check. War attributed to tariffs? Check. The Greeley letter quoted in blissful ignorance of the chronology surrounding the decision for emancipation? Check. Quote from the Charleston debate? Check. Lerone Bennett citation? Check. I am in my last year at NYU Tisch for film, and about to embark on my thesis film. It is a 19th century post civil war period piece that deals with how returning soldiers dealt with not only the transition from war to peace, but a national transition, how to accept half the country that’s been considered an enemy for the last four years, and what price is paid for that acceptance. I recently launched an indiegogo campaign, in an attempt to have my project crowd-funded (small donations from a lot of people). You can get more information at the film’s WordPress site, and make a contribution toward the production at Indiegogo.